We've had many thoughtful nominations for the 2015 Volunteer of the Year Award, and have five wonderful nominees: Cheryl Batchelor, Kim Gardner Duval, Jean and Willie Fetterman, Wendy Maxwell, and Carmen Kay Woodruff. Congratulations to the nominees, you truly represent the best of the best! Cheryl Batchelor is an inspiration to both her colleagues at SECU and to us at SECU Family House, the credit union’s namesake home. She has built a strong reputation for getting the job done whether in the SECU Information Services Department, preparing a meal for guests at SECU Family House, organizing the SECU Information Services Golf Tournament, or serving as the Family House holiday cookie coordinator in her office. Cheryl always delivers with a huge heart and bright smile. Cheryl was the founder and chairperson of the SECU Information Services Golf Tournament which has raised roughly $75,000 for Family House since 2011. The tournament will enter its 12th year this fall. One year, Cheryl brought her parents to our annual barbeque so they could visit the house and witness for themselves why she is so passionate about supporting our guests and mission. They fully understood their daughter’s passion and were bursting with pride. WOW and The Ya Yas are the names of meal provider teams coordinated by Kim Duval. These fancifully named groups of close friends join together every other month to share their culinary talents and fellowship with guests at Family House. Three years ago, Kim became aware of Family House because her father had had an unexpected surgical emergency at the Medical University of South Carolina and she could have used a house like ours while caring for him there. Kim came to visit Family House and quickly decided that meals would be the best way for her to support us. She mustered up two groups of close friends and organized meal teams that alternate months and provide 12 meals a year. Kim plans, organizes, motivates and keeps both groups on task always keeping in mind what would be best for guests. If the main cook isn’t able to attend, Kim handles it and makes sure the meal happens with grace and patience, never letting anyone feel as though they had let her down. Her groups would tell you that Kim is an inspirational leader who helps all who volunteer with her become better people. 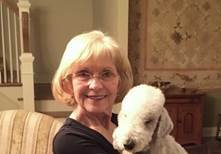 Jean and Willie, a Bedlington terrier, have been visiting Family House once a week for nearly three years. Willie is a licensed pet therapy dog who had to undergo rigorous training before receiving his certification. One of many difficult tests he was required to pass was being able to withstand the approach and touching by several people from all sides at the same time. Wouldn’t that be hard for anyone?! Jean and Willie always bring a smile to guests at the house. Their Tuesday afternoon visits are eagerly anticipated by all. Jean has a wonderful relationship with guests, she is warm, caring, compassionate, and most of all a good listener. She cares so much about guests that she will bring Willie to visit on her off days if she knows a guest will be in the house. As for Willie, he never fails to make everyone laugh. Jean and Willie bring joy, happiness and friendship to people who are possibly having some of the toughest days of their lives. Wendy Maxwell’s involvement with Family House goes back to the days when yard sales were being held to raise funds for a house sort of like Ronald McDonald but for adults. How far we’ve come! Wendy has done practically every volunteer job in the house and has also helped out at numerous BBQs and Galas. She is currently the team lead of the Tuesday laundry group and along with her husband, Mike, picks up donated food from Trader Joe’s the last Monday of every month. Wendy brings magic to any room she is in, her smile is infectious and people feel good when she is around. Wendy is always willing to lend a hand with whatever needs to be done and is the essence of what makes Family House a wonderful place to stay, volunteer and work. Every Monday like clockwork, Carmen is at Family House ready to tackle mountains of towels, sheets, pillow cases, duvet covers, blankets and whatever comes her way. Checking in for her weekly shift, Carmen brings calm to the frenzied activity at the front desk. During the summer and over school breaks, Carmen brings her grandchildren with her to fold – savoring their time together while teaching them about service and the mission of the house. Carmen always offers a warm welcome to new volunteers and helps them navigate the huge bins of laundry, offering patient instruction on how to fold each item properly so that it will fit perfectly on the shelves of our linen closet. Smiles and laughter abound on Mondays in the Solarium when the laundry team is busy at work. Carmen’s gentle joy also spills over to guests and staff alike. She is a lovely, warm and caring presence to have in the house. We all look forward to Mondays thanks to Carmen. Ballots and a ballot box will be placed at the front desk for three weeks beginning on Monday, February 29. Votes by email will also be accepted and should be sent to the Volunteer Coordinator. Email votes will be held in confidence. A run-off will be held in the event of a tie. The 2015 Volunteer of the Year will be announced at the Volunteer Appreciation Breakfast on April 7th.